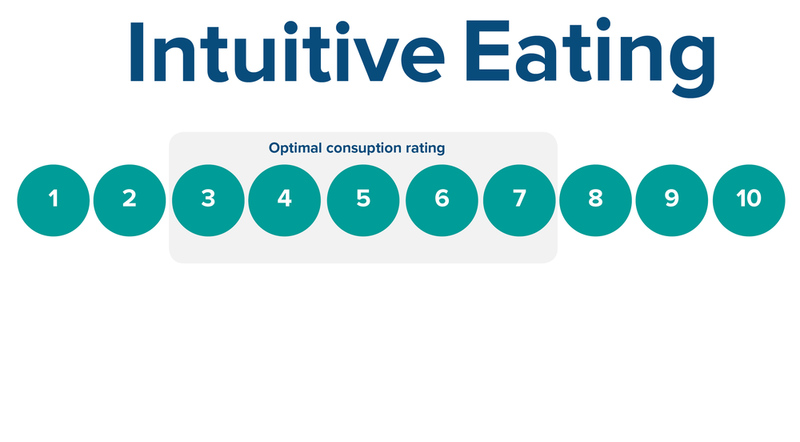 You may have already heard of mindful eating and its benefits but now people are talking about intuitive eating and the benefits it can bring! Mindful eating, is a conscious experience that encourages us to take close note of what we are eating and the sensations we experience as we consume our food. For example, when eating an apple, focus on the taste of an apple, the sound it makes as you bite into it, the smell and so on. Intuitive eating on the other hand is about tapping into your body’s built-in regulatory systems - your feelings of hunger and fullness. This awareness allows us to decide what, how much and when to eat. Paying close attention to your intuitive cues can lead to less emotional eating and improved self-esteem. Research has also shown that it has been linked to effective BMI reduction, as it is a more reliable form of calorie reduction than calorie counting. Rate your fullness on a scale of 1 to 10 before and after eating (1 = starved, 10 = stuffed). Ideally you will start eating at 3 and stop at 7.